The first step required for any kind of change is ultimately confession, admitting a problem exists and change is imperative. Not just a private confession to God, and not within the safety of anonymity, openly presenting your personal failures to another human being at the risk of rejection (but also risking love). After 37 years on this planet, the person I have the hardest time relating to without a filter is myself. Unless we strip away the curtain that hides the reality of our imperfection from ourselves, authentic relationships with another human being is impossible. The Bible recounts the tale of shame entering the world in Genesis 3. The world is exploding in color and life, leading up to this point. The figures of Adam and Eve are figuring out who they are and how to navigate the world around them. Then, they get arrogant, thinking they have it all figured out. They cross a clear boundary God set for them, symbolized by taking a bite of fruit off a forbidden tree which was a step down a path not meant for them. In that moment, recognizing they failed their creator, shame blanketed them both. In a popular Ted talk, Brene Brown tackles the nature of shame and exposes it as the root motivator of destructive and broken behavior. God didn’t come searching to place blame or scold, He searched to find His creation so by seeing, acknowledging and confessing their failure, the would no longer feel like they must hide. Exposing faults, then being accepted despite them, renders shame powerless. The key to defeating shame is finding someone you can lean on to be completely vulnerable and authentic, exposing your soul without fear of judgement or rejection. Someone who will listen while you confess your darkest thoughts and your deepest failures, loving you at your worst simply for who you are. This doesn’t mean overlooking or justifying blatant negative behavior; it is loving you through it, taking you by the hand and finding a way out of it together. Being completely known and not being loved is a deep fear of man; being completely known and loved anyway is one of man’s greatest needs. Risk being loved just as you are. Wake up from your self-induced tranquilization. Where are you? Do you want to stay there? Week 1 made us recognize where we are at; in some, exposing truths about ourselves we’d rather ignore and confessing our role in getting us there. For week 2, we spoke about how to get moving and knowing which path to follow. Jesus emphatically desires a relationship with each of us, but it is not demanded from us. We find and develop that relationship by following His example, obeying the life principles and philosophies He embodies. Jesus’s life and example recorded in the Bible are our map, the Holy Spirit acts as our compass. There are many paths in life. The Holy Spirit guides us, showing us direction, but we can’t know where we’re going without also looking at the map. It’s not always black and white, knowing what we are leaning on for direction and which road is “right”. One thing I have learned through my life is to have multiple resources. The compass tells you what direction you are facing, the map gives you a glimpse of possible routes and the terrain that lay ahead. Using either of these tools exclusively leave you with only half the information. Moving ahead through the this installment of our series, we’ve talked about what we need to do to awaken and free ourselves (confessing and accepting our faults) and we’ve talked about how to find our direction and move forward, stepping beyond our failures. The third installment encourages us to be confident in the steps we take and let the world see the light of our God and feel his love through our scars and brokenness. I’ve always been intrigued by the interwoven shapes and light refraction of broken glass. Glass is so much more beautiful and interesting after its been broken. Such is the human life. Broken glass inspired this drawing. To create this broken effect in a two dimensional drawing, I paused in the middle of creating the image to crumple and damage the page with seams and wrinkles. No one is immune from being broken. Some of us have more scars than others, some scars are self-inflicted. God did not give us the example of Jesus to teach us how to disguise and bury those scars, He illuminates our world when we risk being present and being seen, despite our scars, loving people without reservations or minimum requirements. Jesus is the light, beautifully refracted through our brokenness. The fourth and final installment of Awakenings was a commission to take assessment of our lives and purge it of anything that clouds our relationship with ourselves, our relationships with others and our relationship with God. The message was titled “Remove Doubtful Things”, but I believe “Questionable” is a better word than doubtful, in this case. It is part of our nature to push our limits, to question authority and discover ourselves through experience. This is a double-edged sword that does not cut cleanly. Michael referenced Sodom and Gomorrah in this message this morning. The main focus of his message was about removing “doubtful” (I think questionable is a better word) things from you life to make way to be who you are designed to be in your life. The cities of Sodom and Gomorrah were held to to the condition of only 10 faithful people in the entire population to avoid destruction and they could not even meet that. The point of remembering that story is not about the cities, its not about how terrible the people in those cites were, and its certainly not to condemn specific sin. The story of Sodom and Gomorrah is the story of you and me. I am Sodom, I am Gomorrah. I it is my responsibility to look in my life to create and keep any righteousness inside me. Check your own life. Is anything righteous? Focus there. The last four weeks have laid out methodical steps to re-awaken our complacent and sleeping souls, to come alive in who we are meant to be. It’s time to wake up. Once again, we enter into the home stretch of an election year, bracing for an overload of partisan propaganda and wild rumors of certain Armageddon scenarios if particular candidates are elected. Today opens the ballot boxes for early voting in some states, marking the beginning of the end for this chaos. Looking over the brainstorming notes for future series ideas this summer, a four word phrase coinciding with this season demanded my attention; For God and Country. Despite not having any guarantee this will become a series of messages and drawings, the idea took root and creating this piece became inescapable. I am a huge Marvel comics fan, Stan Lee’s creations inspired much of my early work. Combine that with enjoying the occasional Colbert Report and the phrase, “God and country” immediately brings Captain America’s shield to mind. 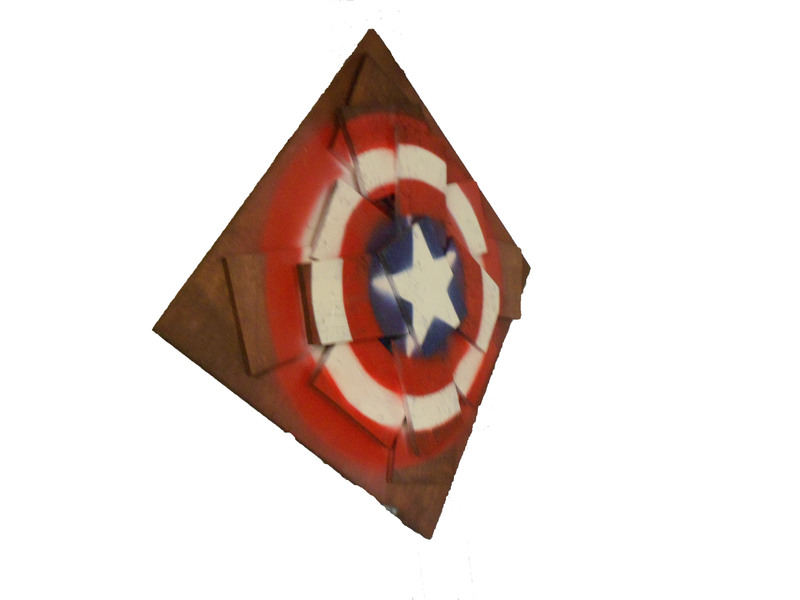 The summer’s release of ‘The Avengers’ and resulting influx of Marvel paraphernalia in toys aisles across the country have, once again, defined this symbol as an indisputable icon of heroism and American patriotism. Exciting as the initial surge of patriotic adrenaline may be, let’s step back and listen for what this piece is saying. The first panel of this piece is a sheet of plywood with a smooth, finished face. This is the start of creation, smooth and untainted. As the image moves toward you, the first layer is segments of this original material, cut into smaller panels. Subsequent layers mimic this panel appearance, but are constructed of lower-quality OSB board. As the piece progresses toward you, it regresses in material quality. This tainting of the materials represents our working relationship with creation. We take the raw materials God invented for our use and destroy them, then reassemble the fragments into something that mimics the original design in an attempt to make the original better. Often this process of re-creation will benefit society, but the materials I chose are an example of the opposite reaction. The imagery here is God’s original creation and our use of that creation to build life as we know it. Just as the materials lose their quality as they are layered, the more effort we spend elevating ourselves, the more fragile our creation becomes. 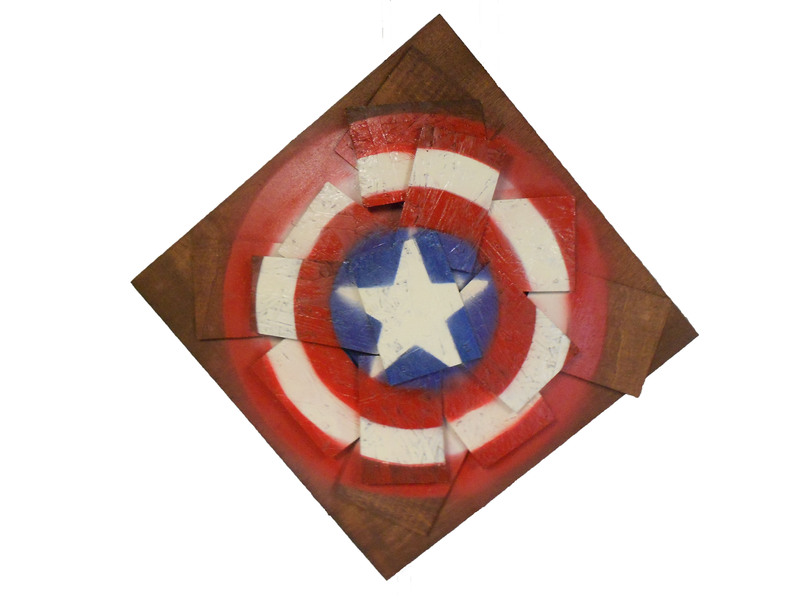 The icon of the Captain America shield is what stands out on this piece. Each layer contains the full shape of the shield, covered by the next layer then spray painted back on. Painting the shield on to the original, smooth panel create the highest quality and most aesthetically pleasing image. As I added the layers of smaller panels and re-applied the shield, the original image lost its crisp quality due to over-spray. We have parts of our original design in sight, we can even discern the full image when we step back and look at the whole picture, but the panels (our efforts to re-define creation) disrupt the image. This distracts us from seeing the big picture, only focusing on a piece or two at one time. As the old adage goes, we can’t see the forest for the trees. The piece hangs on the wall in an awkward position in relation to the floor. Artwork is normally hung in a position that is perpendicular to the floor. This irregular display will drive some viewers crazy, at least, that is my goal. The angled display and fuzzy background layers of this piece communicate to most minds that something is off. Many will want to intervene and repair what they see off, to make sense of the image and settle the uneasiness its imperfection creates in their conscience. Take action to mend what you see broken, redirect what is misguided, cultivate what you find neglected. Be the difference you long to see. Several messages have come together to inspire my latest piece which also happens to represent my word for the year; bold. Last week, North Ridge started a new series titled Bold. In the first message, we discussed the experiences of Peter and John at the hands of the Sanhedrin in Acts 4. After publicly proclaiming the gospel and healing a lame beggar, Peter and John were jailed and abused by the governing authorities. In a political move to avoid public chaos, the Sanhedrin chose to release them with the strict warning to stop talking about Jesus and his recent resurrection. After receiving word of their release, the believers close to Peter and John prayed for their journey back; not for safe travel, but asking the Holy Spirit to instill the boldness to continue healing, sharing, and proclaiming to the public, despite the severe punishment for doing so that the Sanhedrin assured. This inspired me to create an image of what that kind of boldness must look like. Step one to creating this piece was applying a crackled background texture using varying tones of India ink wash and newspaper. Adding an ironic twist of modern social issues to this creation, the paper I used to create this texture included a front page article reporting an increase in childhood poverty in my county. I applied the darkest hue of ink wash with a wide brush using diagonal upward strokes, creating a sense of movement from the bottom of the page toward the words representing culture. In the next layer of the background, I wanted to represent surrounding culture; not necessarily as it is, but as it is perceived by many. This led me to choose the words ‘people’, ‘heathen’ and ‘the world’. Linking this reference to culture to that of 2000 years ago, so I wrote my selected words in Greek, Hebrew, and Arabic; the original languages of the Bible and its Middle-Eastern setting. Painted across the center of the mounting board is a single word. The word is written in Greek, pronounced ‘laos’ and translated ‘people’. Next came ‘the world’ and ‘heathen’ written in Hebrew and Arabic over top of laos. I finished this layer of the background with one English word, ‘UNCLEAN’. I added this word to mirror the gut reflex of facing anything we do not comprehend. At face value alone, the mere presence of foreign text can conjure up emotions of fear, anxiety, and possibly even contempt without ever translating it into one’s native language. Once translated, the words heathen, people, and the world are often used in the context of competing with Christianity and the church. As the layers show, those we perceive as unclean or heathens are still people. In my first post for 2012, I laid out the differences in the words that defined the original group of followers (ekklesia) and the modern transformation of that word into a site and not an influential movement. From the kirche perspective on culture in my piece, the church would act as our safe haven, a clean environment that protects us from the sick and dying world outside. The caution tape stretched across the world, the heathen, the unclean, and outside people in general, warning us from getting too close. For added protection, the surgical mask prevents any airborne transfer of “the world’s” contagion. Like another catastrophic viral outbreak movie, the kirche operates inside boundaries of yellow tape and clean-suits, avoiding contact with any “infected” people and taking necessary precautions when interacting with each other. Ekklesia is the opposite. Ekklesia tosses its mask on the ground, breaks through the caution tape barrier to risk immersing itself into a capricious culture, carrying the vaccine with it. The figure walking into the unclean is purple, the color of royalty in which it is divinely vaccinated and opposite to the yellow hue of the caution tape. ‘Ekklesia’ forms the spine of this figure, creating the back bone required to risk testing one’s spiritual vaccination against the elements of the outside realm. Boldness is an adventure that takes risks, invites injury, sustains losses and experiences victories. Being bold is not safe or comfortable, but hiding in self-imposed quarantine feeds the virus Christ came to eradicate. My prayer is for boldness.